These turkey tenders are coated in crispy potato chips and fresh sage for a fun take on Thanksgiving turkey. Complete this meal with cranberry barbecue dipping sauce. Ben and I live over 2 hours away from both sets of our parents. We’re able to see them a lot, but not having them right next door has presented me with the opportunity to really grow friendships in the area of Michigan where we live. I’m so thankful to have developed some amazing friendships with other stay-at-home moms and their families. Frito-Lay** has inspired me this year to bring friends together with a progressive virtual dinner party where everyone contributes a different dish. Before I bring this fun idea to life in real life, I got together with It’s A Lovely Life and Crazy for Crust to put a spin on traditional recipes for a fun-filled virtual #FritoFriendsgiving menu. I hope you use some of these great recipe ideas to host your own progressive Friendsgiving meal. I was asked to bring the main course to the Frito-Lay Friendsgiving Virtual Progressive Dinner Party. 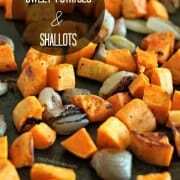 I wanted to make a recipe that would absolutely, 100% taste like Thanksgiving, but I wanted to also make sure that men, women and children would love the recipe I created. They are finger food – just so happens to be perfect for watching a football game! 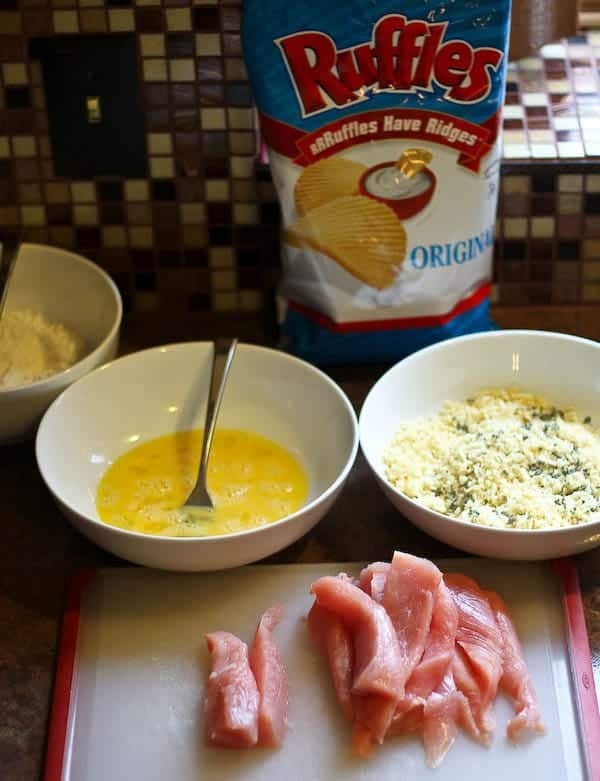 I took turkey tenderloins and breaded them in RUFFLES® Original Potato Chips. 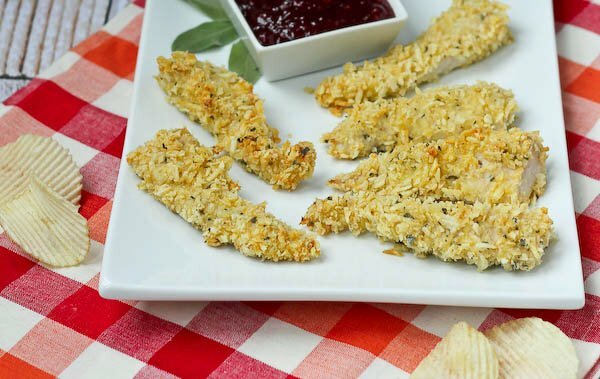 RUFFLES Original Potato Chips are not only perfect for snacking on at parties, but they also make fantastic breading for these turkey tenders I created. The crushed chips clung perfectly to the turkey tenders thanks to a quick dip in flour first and then beaten eggs. They are really easy to make and so much fun to eat! I mixed a bit of fresh sage into the crushed potato chips to really drive home the Thanksgiving – or in this case, Friendsgiving – flavor. But what’s turkey without cranberry sauce? For these turkey tenders, I created a cranberry-raspberry barbecue sauce. 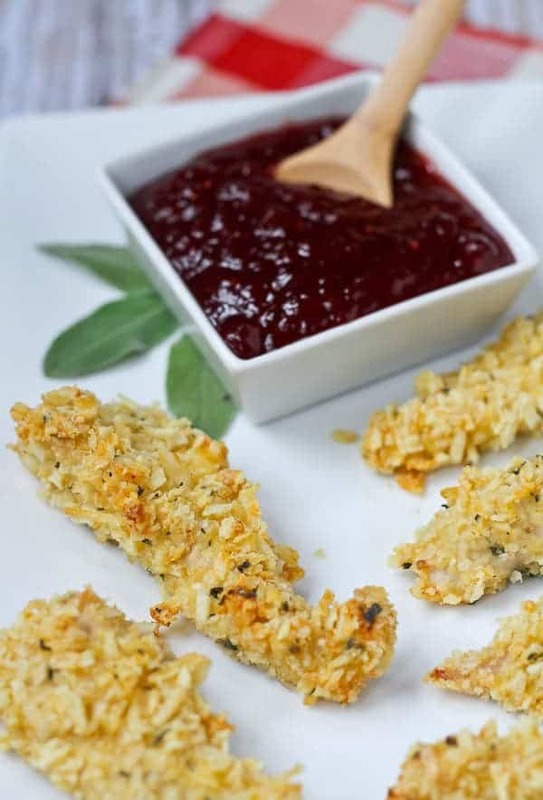 The sauce is heavy on the flavor of the cranberry, which makes it perfect for turkey tender dunking. 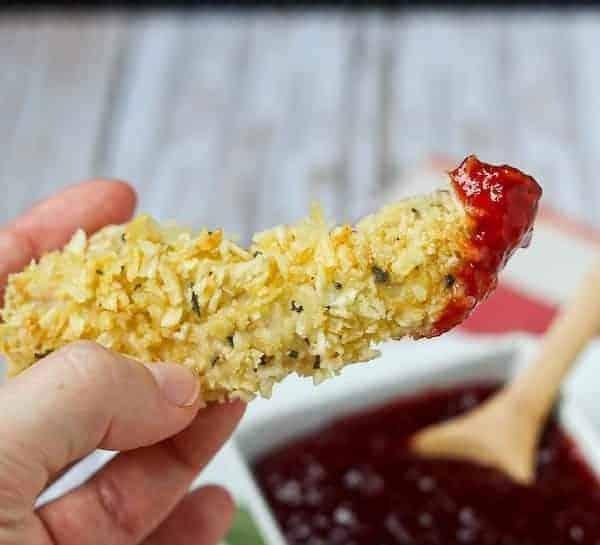 Everyone at your party will love dipping these crunchy turkey tenders into the cranberry barbecue sauce. Ben and the kids loved this recipe. 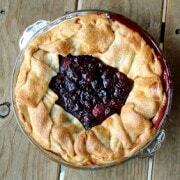 And with a satisfying recipe like this, I don’t want to keep it to myself. I’m already starting to plan Friendsgiving at my house! Preheat oven to 400°F. Spray a large sheet pan with non-stick cooking spray or line with a Silpat baking sheet. 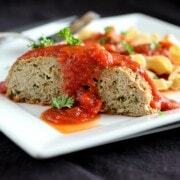 Place flour in one shallow bowl and mix in pepper. In another shallow bowl, add eggs and beat. In a third shallow bowl, add the crushed RUFFLES Original Potato Chips and the chopped sage. Bake for 20 minutes or until cooked through (165°F internal temperature). Meanwhile, prepare dipping sauce by whisking all ingredients together in a bowl until combined. Taste and if desired, add brown sugar for added sweetness. 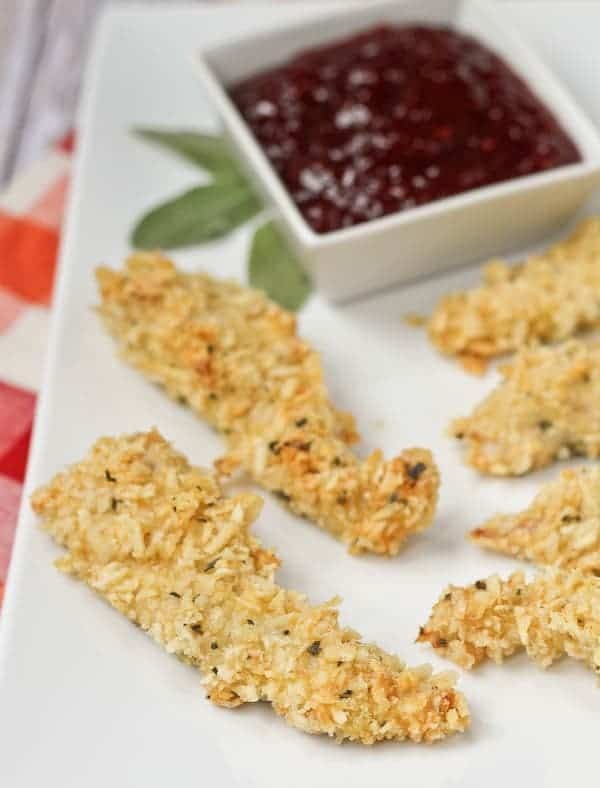 Serve tenders hot with cranberry barbecue dipping sauce. Note: I use a zip-top bag and a rolling pin to finely crush the potato chips. Verdict: I loved these. They turned out even better than I had imagined them in my head. Husband’s take: He really enjoyed these too and took leftovers in his lunch the next day. My daughter was over-the-moon about this meal. She ate better that night than ever! As you all know, my son doesn’t eat much of anything at all. Changes I would make: None!! ** This post was sponsored by Frito-Lay in conjunction with their #FritoFriendsgiving Virtual Progressive Dinner Party. I was compensated for my time, recipe and photos but as always, all opinions are my own. That dipping sauce! I’d be spooning it in my mouth! You had me at CHIPS! 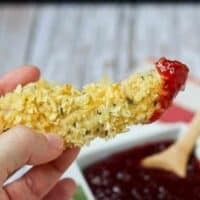 Love these – my husband would love to snack on these while watching the big game! love love love using cranberries as a bbq dipping sauce! I’d love to taste these dipped in the sauce. The crunchy potato chip coating must be real good. What a great idea! I can imagine how yummy the potato chips are on the turkey and the cranberry dipping sauce is brilliant. These are prefect for kiddos too! Yum! I am so making these! My daughter would totally eat them – and that’s a big compliment. If I tell her there are chips on the outside…even better! What?!!!! So cool, such a great idea. Super crunch, I’m sure, and the bbq sauce, YUM! My friends and I used to do a Friendsgiving in college, and I really miss it. I need to bring that back! Totally digging this recipe. I mean, you really can’t go wrong with anything coated in Ruffles. Plus a dipping sauce. Potato chips as breading for turkey tenders is total genius. My nephews would devour these at Thanksgiving, or any day of the year! These look so good – and would be a great addition to the kids table this holiday (or even the grown up table!) Great recipe!! Holy yum! I can see why your family found these irresistible! PS. Don’t worry about the little guy’s eating, he will come around to eat all the food in the house. Trust me! Ah, crisps for dinner. And that cranberry bbq sauce looks totally amazing. Pinned! Mmmm, yes!! I love the crunchy chippy twist and the cranberry dip – inspired! These look amazing! I mean…potato chips for dinner? Yes, please! The dipping sauce is perfection, too.